Those of us, who are of a certain age, remember the famous statement by Ronald Reagan: Freedom is a fragile thing and is never more than one generation away from extinction... The same can be said of Faith, which is its own kind of freedom, wouldn't you say? And while I do not agree with Christian Apologist Ken Ham on his "Young Earth Creationist" theory, I am in full agreement with what he wrote on his website, Answers in Genesis. Mr. Ham said, "Every generation has the same decision to make: Will I serve the God of the Bible or a false god? The “god of this world” may shift his seductions slightly from generation to generation, but the basic challenge is always the same. So, Christians must be ever vigilant. Every newborn must be taught the truth from scratch or else that soul could be completely lost. While statistics indicate that churches and Christian homes are failing to reach kids, God has given us all the resources we need to turn the tide!" 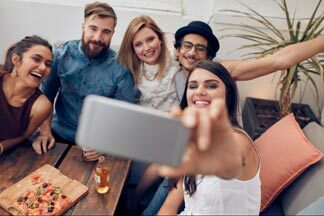 Sadly, I believe this generation of young adults is on the verge of succumbing to a most clever seduction of the Enemy. Dr. R. Albert Mohler Jr., who serves as president of The Southern Baptist Theological Seminary, supports this theory by explaining, "When Christian Smith and his fellow researchers with the National Study of Youth and Religion at the University of North Carolina at Chapel Hill took a close look at the religious beliefs held by American teenagers, they found that the faith held and described by most adolescents came down to something the researchers identified as Moralistic Therapeutic Deism." Exactly what are the foundations of such a belief system? 1) A god exists who created and ordered the world and watches over human life on earth. 2) God wants people to be good, nice, and fair to each other, as taught in the Bible and by most world religions. 3) The central goal of life is to be happy and to feel good about one's self. 4) God does not need to be particularly involved in one’s life except when God is needed to resolve a problem. 5) Good people go to heaven when they die. As you can see, this is a belief system based on the premise that "the self" is primary, and God is an appendage to the lives we live. He's there, but only when we need Him; like a "Medicine Cabinet God". And you can see touches of Gnosticism in these beliefs too: the goal is to be happy, and pleased with yourself; Faith is subjective (personal, individual, emotional, instinctive, intuitive); there is no recognition of God's superiority or Jesus's sacrifice for our sins -- all we have to do is "be Good". In other words, this is very close to the same lies and seduction that Satan offered Adam and Even in the Garden: That the Word (Bible) is not reliable (allowing for doubt and distortion); That God doesn't have our best interests in mind, (if I follow His rules, I won't have any fun in this life! ); and That your sin isn't all that bad (God knows I'm a good person overall and that's what counts). 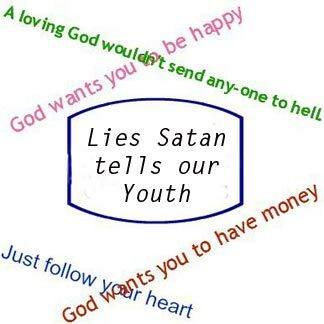 In essence, our latest generation is believing the lie that Satan told Eve: Be your own God! It's abundantly obvious -- most Millennials can tell you more details than you want to know about the lives of favorite musicians and television/movie stars, or about what it takes to get into a good college, but most are not very clear on who Moses and Jesus were. And with this conclusion, it is equally obvious that our culture has not followed God's commandment to "train up" the next generation. He says it over and over in the Bible ... when God miraculously enabled Joshua to lead the people through the Jordan River, the first thing He told Joshua to do was to take twelve stones from the riverbed to build a memorial. But what was the memorial for? God wanted Joshua to explain, "When your children ask their fathers in time to come, saying, ‘What are these stones?’ then you shall let your children know . . . the Lord your God dried up the waters of the Jordan before you until you had crossed over . . . that all the peoples of the earth may know the hand of the Lord, that it is mighty, that you may fear the Lord your God forever” (Joshua 4:21–24). 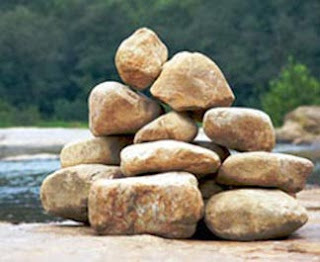 The stones were to remind the parents to make sure they taught the next generation about the true God. They were instructed to pass on the knowledge and fear of God to their children. But, as a nation and a culture, I'm afraid we have failed to do this. When we took God, the Bible, and prayer out of our public schools, [and failed to establish them in our homes], we are left with generations of kids who have no foundational knowledge of God and His Word, and once in college and living on their own, they are likely to abandon Him altogether. What's even more sad to me is that both these kids and their parents have not been taught apologetics ((how to give a reasoned defense of the Christian faith) in their homes or churches, so they don’t believe it themselves and certainly can’t defend it to others. In effect, this theory of Moralistic Therapeutic Deism boils down to a couple of ideas ... It's all about individualism (let's not be judgmental, and everything is relative to the individual); and just "being nice" is central to living a good and happy life and being a good, moral person. That means being nice, kind, pleasant, respectful, responsible, at work on self-improvement, taking care of one’s health, and doing one’s best to be successful. Just like Satan taught: Be your own god! But that's not what God commanded us to teach the next generation! In Deuteronomy 6:6-7, He tells us, "These words which I command you today shall be in your heart. You shall teach them diligently to your children, and shall talk of them when you sit in your house, when you walk by the way, when you lie down, and when you rise up." Instead, we have allowed ourselves to be seduced by Satan: Don't listen to God! He just wants it to be all about Him! I'm offering you an easier, more pleasant faith that is way more tolerant and undemanding. Instead of doctrines of Trinity, holiness, sin, grace, justification, sanctification, church, and heaven and hell, I am offering you a life on this earth [now] centered on happiness, niceness, and an earned heavenly reward (but that's later, you don't have to worry about it now). By now, it should be obvious that Moralistic Therapeutic Deism is a faith in "self", not Faith in God. We tend to treat spiritual problems with a medicinal treatment plan. Sin, and the Wrath and Justice of God, are terms that don't fit in well with our modern language and goal of self-actualization (the realization or fulfillment of one's talents and potentialities). So how do we reach a generation that is falling away from Faith in Jehovah God, as well as a nation that largely considers itself Christian, yet has very little knowledge or experience in Biblical Christianity? It is apparent that we need to return to the directives God has given us in His Word... We must be earnest and persistent in teaching our children what the Bible says about God, so that they know WHAT they believe, WHY they believe it, and HOW to defend the Faith against the attacks of today's secular culture. Then we have a generation that can proclaim the Gospel of the Kingdom of God with AUTHORITY, because they believe by Whose Authority it stands. They must be taught what "Faith in Christ" means... to know what it means to "Be Saved" and to "Walk with God", and all from a Biblical perspective, using God's own words! We must answer their hard questions about sin in our culture and what happens when you die without knowing Jesus as your Savior. We cannot give them more tolerant and permissive answers. They must be taught Truth as God presents it in His Word -- not what the popular opinion is. Once they accept the Bible as true, and the Authority of the One who inspired it to be written, then the world, with all its challenges, will begin to make sense to them. They need to see the reality of sin, and know God's Grace and Mercy, as well as His Judgment. Once this generation knows [and believes] the Gospel Message that Christ died for us, was buried, and rose again with a promise of salvation to all those who have faith in Him, they will know that the power of that Gospel to save sinners rests on the authority of God's Word. They will then need to be encouraged to boldly proclaim that Gospel to a lost world -- something that we have failed to do for several generations, and our society and nation are suffering for it. But it is not too late! We must replace the religion of Moralistic Therapeutic Deism with a genuine Faith in Jesus Christ by committing to instructing our children and grandchildren as God, the Father commanded us. If we plant the seeds of the knowledge and authority of God through His Word, our Father and the Holy Spirit will be faithful to water them. It may take only one generation to lose Faith, but we can begin today to raise up the next one in Truth and Commitment to God and for the salvation of the world. With God and His Word instructing us and them, how can we fail? Judges 2:10-12 All that generation also were gathered to their fathers; and there arose another generation after them who did not know the Lord, nor yet the work which He had done for Israel. Then the sons of Israel did evil in the sight of the Lord and served the Baals, and they forsook the Lord, the God of their fathers, who had brought them out of the land of Egypt, and followed other gods from among the gods of the peoples who were around them, and bowed themselves down to them; thus they provoked the Lord to anger.